There is no doubt that getting a tattoo is one of the most popular things these days. But since a tattoo is a permanent thing, you should be sensible as you choose your designs for tattoos. Avoid making hurried decisions. Picking a design for tattoo at the spur of the moment is a no-no. Bear in mind that it is a lasting thing and so you should spend much time in finding the drawing that will suit you best. Probably the most common mistake is having the name of your current flame tattooed on you. Just think about what will happen if you go your separate ways. Also, consider your profession. Although having a tattoo is becoming more main stream, there are still some jobs and employers who are quite sensitive about this. If you are planning on getting tattooed on a visible area of your body, take these into consideration. While getting designs for tattoos in a foreign language, Kanji, or Chinese characters may seem cool, be extra careful. If you are not fluent in that language or if you cannot read those characters, then be extra cautious. You may opt to have a flash tattoo or a custom tattoo. Flash tattoos are the standard designs and old favorites such as butterflies, hearts, rose, anchor, skull, barbed wire, dragon, and koi fish tattoos among others. Flash tattoos are conventional designs that were prepared for quick tattooing. These tattoo designs make it possible for tattoo shops to handle a large volume of customers using generic tattoos. Custom tattoos are specialised tattoos that are intended to suit your specifications. These are worked out with the tattoo artist. These usually cost more because they require more work and skill. 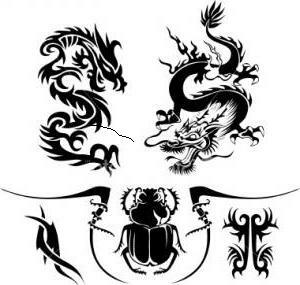 They are suitable for people who want unique tattoo designs. There are also other tattoo designs such as black and gray work. These only make use of black and gray shades to make the final artwork. Tribal tattoos are reminiscent of ancient tattoos and usually make use of bold designs. These are popular and are classic. Photographic quality tattoos or realistic tattoos are more complex to make. Few people actually prefer photo tattoos. Give it a lot of thought and choose a reputable tattoo artist. Ultimately, the designs for tattoos that you decide on should leave you happy and pleased.